Revolutioanry Drag Queen | Revolutions for Fun and Profit! There are only 4 more days to choose Revolutions for Fun and Profit! as the Best Book in Utah for 2010. I need… nay, I desire… nay, I really need for you to nominate my groundbreaking, revolutionary book. 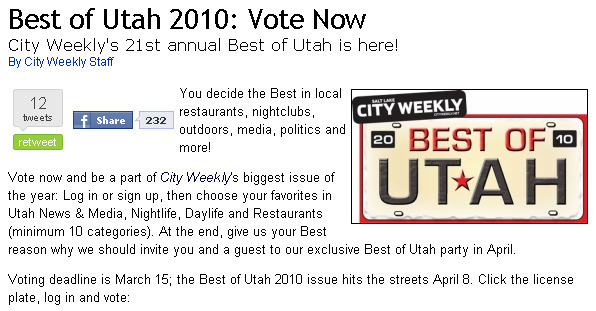 To nominate my book, simply visit the City Weekly’s website for Best of Utah 2010, follow the instructions, and when you get to the part that says Best Your Choice (anything we left off that you love), you will write in Best Book: “Revolutions for Fun and Profit!”. Now maybe you’re not convinced that my book deserves to be the Best Book in Utah for 2010. I can’t imagine why you wouldn’t be convinced (have you read the glowing reviews?! ), but I’m willing to admit that you’re an independent, fence-sitting, swing-voting undecider. And just for good measure, I’m going to assume you’re also bisexual. My book is a good read. My book will sort your recyclables for you. My book was endorsed by the Dolly Lama. Which is the name of a drag queen. Who was paid fourteen bucks to endorse my book. My book always wears protection. My book was once bred with a labrador retriever, and it produced a labradoodle who didn’t know how to read. My book can name all 5 of the Spice Girls, all 7 of the dwarfs, and all 12 steps of Alcoholics Anonymous. My book is perfectly happy making minimum wage, will never ask for health benefits, and is happy just to be in this country. My book thinks Jay Leno is funny when old people are in the room, and thinks Conan O’Brien is funny when normal people are in the room. My book never runs with scissors, it never runs its mouth off, and a river runs through it. Gary Coleman hasn’t written a book yet. If those reasons won’t convince you, then I give up.